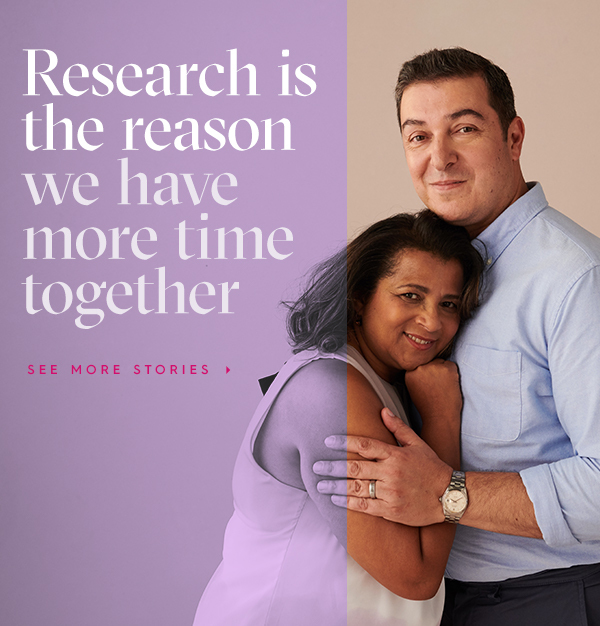 At first glance, it would seem that any of us who follow the breast cancer experience would look to the investigators – the scientists, researchers and their teams – for inspiration. They are, after all, dedicating their lives to fighting cancer. In this conversation, you’ll hear the opposite. To listen to Dr. Gabriel Hortobagyi, you hear the inspiration and insight that he and his teams gain from the grace of breast cancer patients – in particular, people who have triple negative breast cancer and their families. You’ll also hear about the unique, novel research that Dr. Hortobagyi and his colleagues are doing to investigate resistance to various therapies and ways to develop combination therapy to overcome the resistance. This was a powerful, thoughtful, hopeful conversation with a scientist who knows, as he says, that the patient is the most important player on the team. Dr. Hortobagyi is a Professor in the Department of Breast Medical Oncology at the University of Texas MD Anderson Cancer Center. He is also the Chair of the BCRF Scientific Advisory Board. Chris Riback: I’m Chris Riback. This is Investigating Breast Cancer, the podcast of the Breast Cancer Research Foundation and conversations with the world’s leading scientists studying breast cancer prevention, diagnosis, treatment, survivorship and metastasis. More about Dr. Hortobagyi – he is a Professor in the Department of Breast Medical Oncology at the University of Texas MD Anderson Cancer Center. He is also, not insignificantly, the Chair of the BCRF Scientific Advisory Board. Among his many honors and positions: He has served as Past President of the American Society of Clinical Oncology, as a member of the U.S. National Committee for the International Union Against Cancer, on the National Cancer Institute’s Breast Cancer Progress Review Group, chaired the Steering Committee of the Breast Health Global Initiative, and well, the list could go on. Dr. Hortobagyi, thank you for joining me, I appreciate your time. Dr. Hortobagyi: Thank you for having me in this program. Chris Riback: Again, congratulations. You are now about six or eight months into your run as chair of BCRF's Scientific Advisory Board. Is that what you thought it would be? Dr. Hortobagyi: Well, I have been involved with this organization since inception, so I've seen from inside the evolution of the SAB, and it's clearly an honor to take the next step and be in charge for a while. Chris Riback: What's your mission for the board? I'm not sure how long your term is for, but what are your goals? How might you hope that your time is remembered? Dr. Hortobagyi: BCRF is a somewhat different organization, and it is run less formally than many other granting agencies, and by that I mean that while most other agencies just publicize a granting mechanism and let investigators stake the initiative for supplying and proposing projects. We invite people who have already demonstrated success in breast cancer research and on the basis of their track record, we ask them to apply, that is quite different. It's a totally unique model in America or around the world for that matter. The scientific advisory board evolved from a small nucleus of people, who were involved with Claire, Norton, and Evelyn Lauder in the development of this organization. And therefore, the activities of the scientific advisory board are less formal, than other organizations where people might to go through an entirely different process to join. Having said that all members of the scientific advisory board are fairly senior, and fairly well-known on the basis of their scientific contributions to the field. So the state's original objective of the Breast Cancer Research Foundation and therefore of the scientific advisory report, is to eliminate the suffering caused by the diagnosis and development of breast cancer, in the universal population. And in order to accomplish that, our purpose in the scientific advisory board is to recruit the top investigators not only within the United States, and elsewhere in North America, but the rest of the world. Because cancer doesn't have borders and of course, science does not have borders. So our function is to identify those people who should be supported by BCRF. And with that support move the needle towards prevention and cure of breast cancer. And when cure is not possible, then amelioration of quality of life and a better control of symptoms, whether physical or psychological or otherwise. Chris Riback: What an incredible opportunity and responsibility obviously, but it feels from your description that it allows somebody like you to go beyond the work that you're already doing. I mean you've already obviously dedicated your life to the mission that you just described. Helping reduce or eradicate the suffering that occurs from breast cancer. And it's almost a way to go beyond yourself and identify the other researchers, scientists who are doing extraordinary work, maybe work in other forms of cancer, and find ways beyond your own research to help fight the disease and help address the problem. At least that's how I'm interpreting part of what you're saying. I don't know if that's how you view it. Dr. Hortobagyi: Absolutely, so all of the senior members of the Scientific Advisory Board have had decades of experience, and dedication to this particular project and to breast cancer research at large. So throughout those decades, all of us have come in contact with the great majority, if not all of the most recognizable and most accomplished investigators in the field. And we view our function as not only identifying those that we know about, but also those who are emerging and who are the next generation of investigators. Because eventually we will have to pass the baton on to the next group of people who will continue after we are history. And that of course means continuously interacting with other investigators in the field, and identifying people through our own collaborations, through attendance of meetings, through reading journals, through round tables discussions, conferences, congresses and whatnot. And in the process, we also try to balance the BCRF portfolio. By that I mean that there's no organization that has infinite resources. So we need to manage the resources that BCRF is able to raise in the most efficient way. And if we have let's say 200 funded investigators, we do not want to spend the resources on 175 of them doing the same thing. So we try to balance the portfolio so that there is substantial attention being paid to all of the emerging opportunities, for prevention, early diagnosis, monitoring, surgical and radiation therapy, systemic treatments, targeted therapies, and of course the management of survivorship, which in itself is an emerging field of science. So all of that requires continued discussion and of course we are unable to fund all the people we would like to fund, or all the projects we would like to fund. But we do our very best to balance the portfolio so that we have a prominent investigators, and leading projects in all areas that we consider important to improve our ability to treat, and manage and cure breast cancer. Chris Riback: Yes. Well it certainly is an extraordinarily balanced portfolio and the range of projects, and power of projects is really something. I also appreciate the analogy that you mentioned earlier, in that last response about party responsibility at some point will be to pass the baton. Unfortunately for you, fortunately for you I should say that that time is not yet, so let's talk about you and let's talk about your research, and the work that you do. In reading about you, I came across a very intriguing statement that you made a couple of years ago. You said breast cancer is the prototype for cancer prevention. What did you mean by that? Dr. Hortobagyi: What I meant by that is the observations that we have made in the course of managing breast cancer over the past 40, 50 years, have led to new directions in treatment that not only satisfied the need for improving treatment, curative treatment of primary breast cancer, but also opened doors to preventing additional breast cancers. So let me expand a little bit on that. Dr. Hortobagyi: Once you have one breast cancer, you have a certain finite risk of developing another breast cancer, a second or in sometimes a third breast cancer. And that varies depending on certain risk factors, so for instance if you have totally average risk, you're an American born and raised a woman, then you would have about a one in 10 chance of developing breast cancer, if you survive and are cured from your first breast answer, when that second breast cancer will occur. And where in the remaining breast, if you had breast conserving surgery or the contralateral breast if you did not, is not quite predictable, but the risk is estimable, now if you have a strong family history of breast cancer. You are a carrier of one of the gene mutations, or you have such a strong family history that you have multiple siblings, first cousins, first degree relatives in general. Then you risk is substantially higher. And we have observed during the development of what we call adjuvant systemic therapy, but especially adjuvant hormonal treatment or endocrine treatment, that when you administer a drug such as Tamoxifen, or such as Anastrozole, to patients with hormone receptor positive primary breast cancer, not only do you decrease the risk of a reoccurrence of that breast cancer or metastasis from that breast cancer by about 50%, but you also reduce the risk of developing a second or contralateral breast cancer by about the same proportion. So it was that first observation, which was actually made in the 1980s that we stopped and thought, "Gee, this sounds very much like a prevention intervention." And on the basis of that we developed an entire program. We ... I'm using the royal we, but I'm talking about the breast cancer community, and that led to six or seven very large prospective randomized trials that the in fact demonstrated, that if you take individuals at risk for developing in this case not the second, but the first breast cancer, based on a variety of risk factors, then you can reduce that occurrence by about 50%. It's a little bit lower than 50%, let's say 4 or 5% or so. If you use either five years of Tamoxifen, or a similar duration of drugs such as Anastrozole or Letrozole or Exemestane, which are the aromatase inhibitors we use to treat advanced breast cancer, but in this case they would be used as a primary prevention for breast cancer. And so that has been amply documented, and because of that, because this was actually the first observation, but was not only determined that anecdotally, but confirmed prospectively in multiple trials, and the large meta analysis that was performed after all the trials were completed, that we made the statement, that breast cancer is the prototype for a cancer prevention. And that similar observations can be made certainly in other hormone dependent cancers, and perhaps under different circumstances using different interventions in other malignancies of man and woman. Chris Riback: It's been one of the consistent themes of this conversations, and part of the discovery that's been really amazing for me in particular, it is just what you described, the way that lessons, insights, successes, failures in one area of cancer get translated if you will, into other areas. And so many of the scientists that I've gotten to talk with have taken findings or insights from prostate cancer, or some other area and apply it to breast cancer and in reverse as well, which I take as a little bit of what you're saying. Maybe not everything that you're saying, but a little bit of what you're saying. An area of your research, triple negative breast cancer. That is a tough area to work in obviously, probably you'll tell me if you disagree, it might not get tougher than that. Why do you focus there? Dr. Hortobagyi: If you ... Forgive me, I would like to step back one second just to make a comment about what you just said, prior to asking me this question about triple negative breast cancer, because I think it is an enormously important observation you made. Dr. Hortobagyi: And that is the major reason why the overwhelming majority of scientists support research for the sake of research, as opposed to purely applied research. Let me explain. When you work for the pharmaceutical industry and you're a scientist, your task is to develop eventually a commercially viable product that your company can sell, while at the same time of course doing some good by serving as treatment for a condition of one sort or another. In pure science you ask fundamental questions without necessarily knowing where you're heading with that. And this sometimes frustrates lay folks and politicians at large, who have to divvy up limited resources. But the fundamental research supported for instance by the National Institutes of Health, or in the case of this conversation by BCRF, is incredibly important. Because the reality is that most applied research fails at the moment, not necessarily forever, but it fails when you do not have answers to other related questions. And it is because of the uncertainty of where the next step forward is going to come from. That it is so important that we support all research related to in this case cancer, because it is not only what applies to breast cancer that will work for breast cancer, but the next observation as you mentioned in prostate cancer or perhaps in melanoma, or perhaps in leukemia and sometimes in I don't know, multiple sclerosis or cardiovascular disease, will be the piece of the puzzle that is missing in order to take the next giant step forward in controlling, curing or preventing breast cancer. That is a concept that is so important and so fundamental in the field of research, that we can not for a second for get it. All right now let me get back to your question about triple negative breast cancer. Chris Riback: Of course, but thank you obviously for making that point and putting a punctuation mark on it, because yes it certainly seems that way. And it really has come across from these conversations and in particular, and this is maybe something for a separate conversation at a time when so many science budgets are maybe getting cut in various areas. Yes the point that you just made is just so incredibly important so thank you for that. And so to talk to me ... Triple negative breast cancer, devastating obviously. Dr. Hortobagyi: So triple negative breast cancer is defined as a lack of expression of three gene products, estrogen receptor, progesterone receptor and the human epidermal growth factor receptor 2, HER2 and therefore being negatively defined as opposed to being defined by a positive attribute. It is a wastebasket diagnosis as we call informally, because it is not a single condition, but it is a group of diseases that just happen to share those characteristics. The lack of expression of ERPR and HER2, that group represents about 15% of primary breast cancers. Somewhat higher proportion of metastatic breast cancers, because it prognosis of primary triple negative breast cancer is less favorable than that of the rest of breast cancer. Therefore, it is disproportionately over represented in the metastatic setting, stage by stage it is associated with a less favorable prognosis after optimal therapy. Then either the luminal types of breast cancer or the HER2 enriched breast cancers. And to a large extent that is related to the fact that we do not have a single effective targeted therapy to use, as opposed to the luminal cancers where we have multiple targeted therapies, including all the endocrine agent and CDK 4/6 inhibitors and [inaudible] and the tire seen kinase inhibitors etcetera, and in the HER2 enriched population where anti HER2 therapies such as monoclonal antibodies and tire seen kinase inhibitors and antibody drug conjugates have made an enormous difference. So if we go back about 20 years when HER2 was first identified, and the diagnostic was discovered that time ... And if you were able to classify your breast cancers into hormone receptor positive, and hormone receptor negative, and the third group as being HER2 enriched, well the worst prognostic group was HER2+ or HER2 enriched group. The second worst prognostic group was the cripple negative group, and the best prognostic group was the hormonal sensitive, or the hormone receptor positive group. Since the development of all these targeted therapies for HER2+ disease, that has become arguably the most favorable group, because treatment make such an enormous difference, that this poorly prognostic group has become a favorable prognostic group. Something similar has happened, although it's less dramatically in the hormone receptor positive groups, and the orphan in this remain the triple negative group of breast cancers. Now to the best of our understanding triple negative breast cancer is a conglomerate of probably five or six or maybe seven molecularly distinct subgroups. And because they are different, the likely emergence of an effective targeted therapy will be different for each of the subgroups. And that's what has complicated the matter here. So some of those triple negative subgroups are apparently androgen receptor positive. Others express a molecular profile that suggests that they are manipulated by immunological reactions, and therefore might be candidates for modern immunotherapy, some others are very basal like tumors that lack just about all of the other characteristics from the other groups, but they may have mutations or over express genes that accelerate their growth and division, and the dissemination throughout the body. And those might require yet a different group of targeted therapies. So my team has focused on this triple negative breast cancer, and continues to focus on that, both in the lab and clinical trials, in the lab we have worked in the development of PARP inhibitors and more recently in the development of checkpoint inhibitors, immunological checkpoint inhibitors, PD-1 and PD-L1 inhibitors. And in the combination of these two groups of agents, so PARP inhibitors with PD-L1 inhibitors and PD-1 inhibitors, in the clinical arena we have developed what we call a bucket clinical trial schema in which we take all patients with triple negative breast cancer, and sequence their genome, well not their entire genome, but let's say several hundred of the genes that are commonly associated with the development of breast cancer in general, in triple negative breast cancer in particular. And through that sequencing, we identify those molecular abnormalities that could serve as therapeutic targets, and we focus especially on those therapeutic targets against which there are either approved, or investigational drugs in development. Because when you do that, you divide a really small population into even smaller subgroups, we can't possibly hope for running large randomized trials in each of those subgroups. So instead ones we identify a molecular abnormality. If we have a targeted treatment that might be useful to test against that molecular abnormality, then we place that patient and that treatment into one bucket and treat them, and we hope to accumulate enough numbers in each of those buckets of which there are a pretty good number by now. So at the end of the day we can come up with some practical conclusions of, this drug is likely to work in this particular setting, in the face of this particular molecular abnormality, or this combination of drugs might do that. So that has been the focus of the MD Anderson Moon Shots Program, which is focused entirely on triple negative breast cancer. In the meantime as I mentioned earlier, we are working on specific areas of interest, immuno-oncology and the contribution of PARP inhibitors and checkpoint inhibitors should be controlled, and eradication of triple negative breast cancers. Chris Riback: How do you or how would you explain to me the Moon Shot Project obviously ... It's a Moon Shot project and by its nature ... And it kind of relates perhaps a bit to what you said earlier, that so much of researches needs to be done for research sake and it may or may not deliver immediately, but you learn different things, and it may deliver in other areas. And at the same time just maybe a moon shot lands. What do you communicate or how do you communicate where you're at, to people who suffer from triple negative breast cancer or family members, I guess in terms of your hypothesis. And then I know you're just gathering data, so it's likely too early to start discussing what you might be seeing. But anything that you can say about your hypothesis and the testing of your hypothesis, vis a vis the trials that you're doing? Dr. Hortobagyi: Well so clearly this is teamwork. And when I say teamwork, it's not only a team of scientists and clinicians, but it's a team composed of patients, their families, funding agencies, pharmaceutical companies and all of the scientists and physicians involved in this. So we considered that we are the patients partners in this enterprise, because the patient is the single most interested party in this team, and we are their agents so once you understand that position in the team, then you realize that you have to be very transparent about what you do. So whenever we see a patient with triple negative breast cancer for the first time, we spend a fair amount of time, we meaning the physicians and also our clinical team, the nurses, nurse practitioners, clinical pharmacists, etcetera, to make sure that we impart as detailed in education about what triple negative breast cancer is all about. The limitations of our current treatments, what is realistically achievable with the state of the art acknowledgement today, and what we're hoping to get to in the process of developing novel treatments. And in that process then we explain why we need to do certain things. So for instance we tell them about what we understand about the molecular biology of triple negative breast cancer, what we already know are the major molecular abnormalities, the p53 mutations, the EGFR over expression, the Pf3 kinase mutations, certain pathways that are disregulated and so on. Without trying to drown the main in scientific gobbledygook but, so as to tell them that we already have made a certain amount of progress in understanding in greater detail, in greater depth what we think makes a triple negative breast cancer or such an aggressive disease. And then we take the next step by saying, "But we hope that in the process of attacking those molecular abnormalities we already know about, we can take steps to understand what else treatment accomplishes. And for that we need to do a second biopsy so that after we start your treatment with let's say an anti EGFR antibody that we know what happens to two weeks or two months later. And we can correlate that to the clinical response as well as to the molecular changes that take place. And only by doing this systematically will we learn why certain treatments based on a solid scientific hypotheses work, and why are other treatments based on equally solid scientific hypotheses do not work, and we will understand mechanisms of resistance, we will understand why certain molecular abnormalities are passenger abnormalities, and not drivers off of the behavior of triple negative breast cancer." And it turns out that when you ask patients and you explain to them why you want to do a first, and then the second biopsy, and they understand what you are trying to accomplish, they are much more aggressive than most physicians would be. So it's been an interesting evolution. Now over the past 10 years I would say that a distinct majority of oncologists both in community practice, and in the research community have come around and are much more accepting of what we need to do, in order to understand what our treatments do and how cancers evolve throughout treatment. Chris Riback: Well, it's so interesting to hear about, and it's got to be very inspiring for somebody like you and for the other researchers, and all the medical practitioners. I mean you describe these patients as the primary player, and surely they are part of a club, part of a team that they never wanted to be on. But I would imagine that what I'm hearing from you is they see a ... Not all of them but the ones that you're talking about and the ones who are able, see a cause that is perhaps bigger than themselves, and the opportunity to almost literally give something of themselves for other people, and for the research. And that's gotta be incredibly humbling and inspiring for somebody like you. Dr. Hortobagyi: One of the interesting things that I've learned throughout my career, and I must just mention here that I learn something from every patient I see. It is truly an amazing process, one of the things I learned, and it took me years and years to understand it, is that I always thought that cancer was and is a horrible disease. It can be disfiguring, it can cause an incredible amount of suffering and symptoms and pain and of course expenses and it leads people into bankruptcy. And many still die of it. So I always thought of it as this horrible, absolutely horrible thing that had incomprehensible raise on debt. And yet I saw time and time again and heard from many of my patients that cancer has made them better people, and it was hard for me to understand that, I tried to put myself in their shoes and I would imagine that if I develop breast cancer, I would be angry. I would be frustrated, I would be really crying out for why me and how could this happen to me, and just lash out at everything and everybody around me. And very few of my patients do that if any, because being faced ... And this I'm just synthesizing to you many years of trying to understand this, I tried to face a potentially lethal diagnosis. It refocuses their mind the and so many of the peripheral and superficial things that we worry about as human beings in our usual [inaudible] life, just fall by the wayside. And they stop being important and they start focusing what they eventually define as the most important things in their life. And those become to a large extent relationships. So family, friends, children, grand children, and so many of the other annoyances just stop being important, and they just sort of disappear. And by making that transition, that transformation into focusing on what is really important in life, they become better people. And in that sense they are better people than those of us who treat them because we still carry that baggage of focusing on minor things, and minor irritants in life. And this has been an incredible phenomenon, and understanding that is totally humbling. Chris Riback: That is such an extraordinary insight and I can only imagine to see, to experience that level of grace and see it in action, and perhaps regularly as you do. Yes, that really must change one's view and open some eyes. Thank you. Thank you so much for the conversation. Thank you for the work that you do and your team does every day. Dr. Hortobagyi: It's an honor and a pleasure to be involved in something that is more like a hobby for me. In retrospect I would have done it even if I didn't get paid for the work I do, and it has been incredibly rewarding. Chris Riback: That's terrific. We'll make sure that the powers at the Anderson Cancer Center don't know that you would actually work for free. We'll try to make sure ... But your point is understood. Thank you. Thank you for your time. Chris Riback: That was my conversation with Dr. Hortobagyi. My thanks to Dr. Hortobagyi for joining and you for listening. To learn more about breast cancer research or to subscribe to our podcast go to bcrf.org/podcasts.